Habitat: Desert, Upland, Mountain, Riparian. These vines grow in canyons or in riparian areas. Description: The flowers are tiny, numerous, and in drooping clusters. 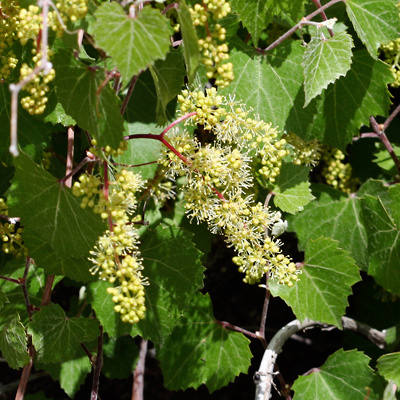 The flowers are followed by clusters of small, round, green ripening to dark purple-blue grapes with a powdery-white bloom. The fruit is very popular with birds and can disappear quickly when ripe. The leaves have coarsely toothed margins and are dark green and heart-shaped. The vines are rambling and woody. 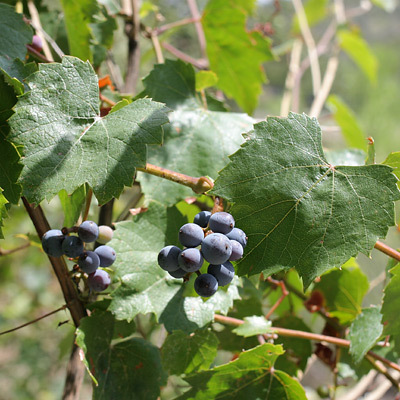 Edible – Although small, tart, and seedy, the ripe grapes are edible and quite flavorful. Like those of cultivated grapes, the young leaves are also edible and can be used as a wrap for baked food.